The Jump Squat - For Powerful Legs! The jump squat is a great lower body exercise for developing powerful legs. As a body-weight exercise or with weights, they are perfect for sports training or any other activity that needs explosive leg movement. This is how to do a basic jump squat with just your body-weight. As well as developing explosive leg strength, it's an excellent plyometric exercise for increasing explosive muscle contraction in the legs. Stand up straight and clasp your hands behind your head, in front of you to your chest, or hold them at your sides. Have your feet spread shoulder width, feet pointing slightly out. 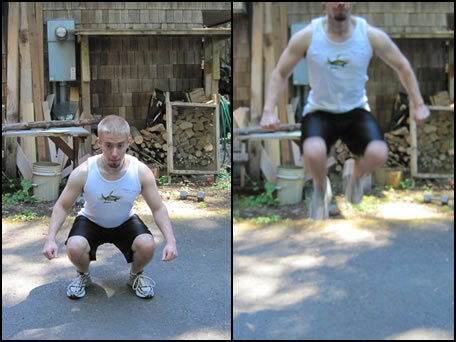 Bend your knees till your thighs are parallel to the ground in a squat, and then jump up as high as you can. When coming down, be careful to land well and absorb the impact with your knees, hips, and ankles. Then, jump again. The first few times you do this, go slowly, and you should pause to stabilize yourself between squats. But after you get the hang of it, just keep going. A weighted jump squat is just a harder version of the regular ones. If you want the plyometric benefits do them un-weighted, but if you just want more strength then add weights. You can use a barbell held behind the shoulders like regular squats; hold dumbbells in each hand; wear a weight vest; or even hold on to a kettlebell. These are a great alternative for athletes who can't do Olympic lifts for leg strength. Be especially careful to start slowly and make sure you absorb the impact well when you land. It's easy to hurt your knees by landing and not absorbing the impact. This is the conservative end of the spectrum for weight, since you have to squat a lot to make that equation give you a non-negative number. I personally use a rule of thumb that 15-20% of what I'm regularly squatting should be the weight that I do jump squats with. I also listen to my body carefully. If I can't do it with good form, or if it hurts me, then I'll switch to less weight or none at all. These puppies are perfect for building explosive leg strength. If you want a higher vertical jump or more power as you push off the starting blocks, work these into a weight training routine for really fantastic results. • Click HERE to leave 'The Jump Squat for Powerful Legs!' & go back to the Home-page!